Her 23-year-old sister, Yukari, refuses to go to an arranged marriage meeting. So 16-year-old Hana Nonomura takes the meeting with 26-year-old Takane Saibara, the heir to a vast business fortune. Hana and Yukari's father works for the company owned by Takane's family, and he fears that Yukari's refusal would cost him his job. After they meet, the heir and the high school girl start to fall in love. As Takane & Hana, Vol. 8 (Chapters 40 to 45) opens, it's Valentine's Day, when girls give chocolates to boys (in Japan). When an unannounced guest pops in, however, will Hana have a chance to give Takane chocolate? Does he even want chocolates from Hana? Plus, Hana's family is in for a couple of big surprises concerning their living arrangement. THE LOWDOWN: I always describe the Takane & Hana manga as a familiar kind of shojo young romance manga. Yes, it is, but it is a sweet read, always with a surprise or two. Takane & Hana Graphic Novel Volume 8 is moving along with the series' usual romantic entanglements and arguments between young lovers. Then, creator Yuki Shiwasu offers a whopper of a surprise that unfurls like a sly shojo manga serpent in Chapter 45. Under Ysabet Reinhardt MacFarlane's sparkling dialogue the steadiness of Vol. 8 becomes a surprising delight. Now, we have to show up for Vol. 9. 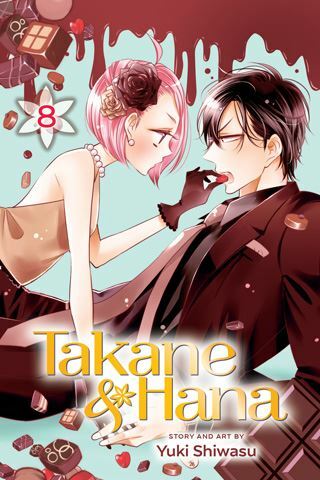 I READS YOU RECOMMENDS: Fans of teen shojo manga will want to read the Shojo Beat title, Takane & Hana.